Note from Pat: This is not about a fascinating subject. It is about buying kitchen tile. But lots of folks ask me about home ownership, and living in Costa Rica. This just shows how something mundane and routine, can become complicated and sometimes an adventure! “We need a new kitchen” Yes, I know. This has been my wife’s mantra for a couple of years. It comes up every time we talk about Monteverde, where we own a small vacation home. I love my wife, and she is definitely not a nag. But if Monteverde comes up in the conversation, she mentions the kitchen. We renovated our cute little Tico style home when we purchased it a few years ago. A contractor friend and a couple of guys from his crew came down from New Orleans to get the ball rolling. One of the projects was a kitchen counter top made from huge planks of beautiful local hardwood. The only problem was that the wood had not been dried. As it aged, it “cupped” or curved. It got to the point that even a wine glass wouldn’t stand up straight. The hot plate wobbled, and forget about mixing anything in a bowl. Yes dear, we do need a new kitchen. 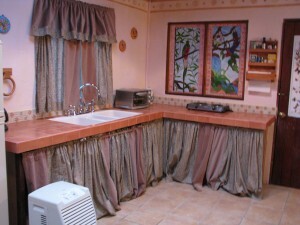 We had renovated our kitchen in New Orleans after Hurricane Katrina. Our special order three bay sink arrived blemished, and the manufacturer sent us another. They did not want the other one back. The blemish wasn’t really that bad, so we put in in the attic. It sat there for five years. We eventually decided to bring it to Costa Rica, and did so a year ago. We brought it down as checked baggage, for a big fee. It had sat in our “bodega” ever since. It was time to get something done. We had met with a local contractor, Manuel Mata during our last visit. We have used Manuel in the past, mostly for electrical projects. But he is also known locally as a very skilled “constructor”. He is also just a very friendly and easy going guy. We outlined our plan, and asked for his input. We settled on a slightly larger L shaped ceramic tile countertop, with shelves below. Simple and functional. All we had to do was purchase the tile, and coordinate his schedule with our next visit. We have learned from experience that we want to be around when big projects are being done. We arrived in Liberia on a Wednesday afternoon. We had left New Orleans early and were already toasty from lack of sleep. We still had to shop for tile, and hit the “gringo” grocery store for supplies. We mentioned the tile to the rental car guy. He told us to go to Santa Cruz, about 45 minutes away. We could buy handmade tiles from Guatil. Guatil is a locally famous little town, and Melissa and I had always wanted to visit. They have been making pottery for at least 200 years. Literally everyone in town is involved in this local folk art. Tile from Guatil sounded great. But that would add an hour and a half of driving to an already long day. We decided that we would just shop in Liberia, before making the 2½ hour drive to Monteverde. The first stop wasn’t promising. The “ceramica” was either way too plain, or way too gaudy, or just weird. Plain primary colors or fake wood. Overly detailed fake marble abounded. There was one tile that had water splashes printed over fake marble. I had seen this pattern in every public urinal in the country. I wasn’t putting it on my countertop! We tried a few more places, and quickly realized that everyone had the same tile. We finally found the gringo ceramic store. Lots of beige and rough stone. It was all expensive, and what you would find in a suburban McMansion. Our home is simple and we like the rustic feel. This wasn’t working for us either. We finally threw in the towel, and drove to the house. We met with Manuel the next morning. He agreed to come the next morning to start demolishing the old kitchen and roughing in the new one. We also learned that we needed some plumbing parts that were not available in our little town. So Melissa and I decided to take a day trip. It would be fun day. We would leave early on Friday, and buy the plumbing parts in Liberia, then go to Guatil for the tile. Then we would finish the day with a stop at “Bob’s”, in the little beach town of Playa del Coco. Bob’s place is actually named Papagayo Seafood. Bob is the owner and chef, from Baton Rouge. Local friends from the tourism business had taken us there years ago, and it is a favorite stop for us when we are in this part of the country. Fresh fish and shrimp, done by a fellow Louisianan. Well prepared and spicy. Just our style. This was shaping up to be fun excursion. Plus if we got done early enough, we might even get an hour or two of beach time! But I have been to Costa Rica enough to realize that maybe I was being a little optimistic. We got a late start. But the drive back down the mountain was very nice. It was a beautiful clear day. On the east side of the road, we saw one beautiful vista after another. Rolling hills, huge green valleys, and an ever changing cloudscape playing over the mountains. On the west side we could see all the way to the Golf of Nicoya. Even after twenty years of visiting, I still marvel at these views. We rattled down the bumpy road to Las Juntas, where we joined the Pan American highway. This is THE major traffic artery in Costa Rica. They had been repairing a bridge when we came in from the airport. But we hit it right, and the delay had not been bad. The bridge repairs were continuing this day too, but now they were also paving the road. Again, we hit it right. But we saw a two mile long delay in the oncoming lane. We dreaded the return. We had to knock around Liberia for over an hour before we found the plumbing parts, then it was on to Santa Cruz. It was getting late in the day, but we figured that there might be a store that stocked Guatil tile. So we asked around. “Ceramica Senor? Si, here is some that looks like wood. No? Here is one that looks like water splashes. Perfect for your kitchen!” We headed for Guatil. Guatil was extremely fun and interesting. 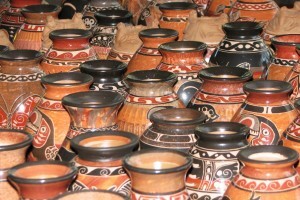 The pottery from there is widely sold in Costa Rica. So we were already familiar with this beautiful folk art. We have a couple of pieces in our home, and have purchased some as gifts for friends. But we knew little about the town. We had heard that many years before, the community had gotten together to build a kiln for all to share. But these days, it seemed that most folks had their own. Just about every house had a wood pile, and a little igloo shaped stone kiln. We stopped at one little “tiende” that had a group of guys working on pottery in back. We asked for ceramica. We were met with a blank stare. The guy spoke passable English. When he realized what we were asking for, he just shook his head. The material was not durable enough for a countertop. Maybe for a backsplash. But they didn’t make tiles. We still enjoyed our visit and he took us though the whole process. 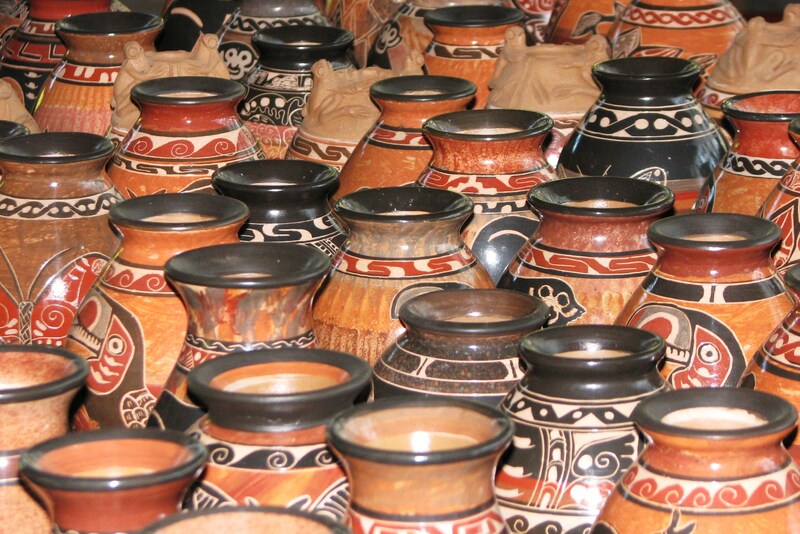 Local clay of different colors is collected from around the region. The pots are made from a clay that dries white. Then thin layers of the desired colors of clay are applied with a paintbrush. We watched as one of the artisans “painted” a monkey on a pot with clay. Then the clay dries for a few more days. They go back with a stylus, and cut grooves down to the different colored layers t o finish the design. The pot is then finished with wax, and fired. The result is a wonderfully detailed piece of pottery. Most of these are nature themed. Monkeys, butterflies, waves, birds, etc. There are some artesians making more abstract patterns as well. We purchased a couple of small pieces. Including one for my ever diligent assistant, Jennifer. But we still needed tile, and it was getting late. So we continued our trek, and ended up in Nicoya. We stopped at one store with more of the same old stuff, and found another high end “salon” or showroom. We were met by a pretty and stylish young woman. They had exactly what we wanted, small glazed coffee colored tiles. They were more expensive then we planned, but we were getting desperate. We told her what we wanted. She said we could pick them up in five days. This wouldn’t do! We needed these now. She saw our anguish. I wish I could remember the name of this store. I would love to tell her boss how sweet and helpful this young woman was. She called a large store in downtown Nicoya, and though it was getting late, she told them we were on our way. She gave us directions, and we dashed off. Did you know that there are no street addresses in Costa Rica? It’s true. Our directions were “From the INS (national insurance) office go 400 meters west, the go 200 meters north”. Usually, (but not always) 100 meters translates to one block. We forget to even get the name of the store. We hit downtown Nicoya at rush hour. The main drag was a parking lot. It seemed that one cop was trying to direct traffic for the entire town. We picked our way through the traffic, and stopped a couple of times to ask local folks for directions to the INS office. We just couldn’t find it, and the traffic was defeating us. It was almost 5:00 PM. We were getting tired and stressed. We had not eaten since breakfast, and now we were not going to get tile. It wasn‘t going well. I have always told me wife that one of my many attributes is my “impeccable sense of direction”. She always gives me a loving smile. I don’t know how I pulled this off. But I figured that I would just head four blocks west, and wing it. I just made the turn and went. Melissa was unconvinced, and told me so. I told her not to worry, as the street kind of ended at a residential section. I turned north. I said the store should be right….here. And there it was. We had pulled up to “Pisas de la Bajura”. A tile warehouse. A big one. Only 15 minutes before closing. They must have thought that these two giddy gringos were on drugs. They had lots of choices, and we were happy to say the least. They had exactly what we were looking for. We settled on a simple 6 inch terracotta tile, with a rustic edge for the countertop. We chose an understated pattern with leaves and flowers for the backsplash. Not a water splash patterned tile in the place. And the prices were the best we had seen all day. We left as happy campers. Melissa was navigating, and had the map in her lap. She pointed out that we were so far south that it didn’t make sense to go back through Liberia. We should just drive twenty miles, and cross the Tempisque river bridge back to the mainland. We would end up hitting the Pan American highway near Las Juntas. At first, I resisted a little. I wanted to go to Bob’s! But I guess my impeccable sense of direction has rubbed off on her. She pointed out that on a normal day, this was at least an hour shorter, maybe even quicker than that. We would also miss most of the traffic jams due to the roadwork. She had me there. 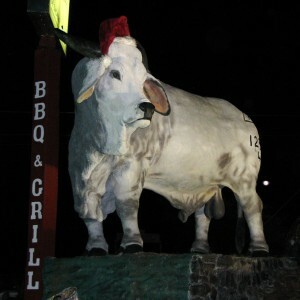 So instead of Bob’s, we got to eat at our favorite BBQ restaurant, Tres Hermanos. This is at the corner of the bridge road and the Pan Am highway. Ya know, nothing’ says good eatin’ like a twenty foot tall statue of an anatomically correct brahma bull. Nothing says Happy Holidays, like putting a giant freakin Santa hat on it. The construction traffic on the Pan Am highway was backed up way past the restaurant, but we slipped in from the side road. We ordered up some drinks. Melissa had the pork ribs, and I had a very good 16 ounce rib eye. They cook over a real wood fire here, and really know what they are doing. The owners are from Texas, and they even host an annual BBQ competition. They even make thier own Texas style sausage. While we ate and drank, we relaxed and watched the traffic. It seemed that the stoppage alternated directions every thirty minutes. We started to time the delays, and had another drink. We did this to kill some time. Plus after the day we had, we really wanted another drink. When we edged onto the road again, we were close to the actual bridge construction. Less than a minute later, the traffic started to flow. We breezed through, and turned off at Las Juntas for the ride back up the mountain. We were tired, and felt every bump on the unpaved road. But ya know, it had been a pretty awesome day!